VANKLEEK HILL – If you have always wanted to try your hand at being an archaeologist, here’s your chance. An archaeological dig is in the works for the Higginson Observation Tower site this spring and the plan is to let volunteers in on the fun of uncovering some of Vankleek Hill’s past. A limited dig will be conducted this spring inside the existing stone ruins and within two feet to three feet around the perimeter of the tower, which is located on property immediately north of St. John the Apostle Anglican Church in Vankleek Hill. The tower, and an L-shaped piece of property was donated to Champlain Township by Phil Arber. The tower and donated land became the property of Champlain Township officially in early February. Archaeologist Jean-Luc Pilon is assisting the Higginson Tower Committee to organize the dig. Pilon, originally from Vankleek Hill, is an adjunct research prrofessor with the Carleton University sociology and anthropology department. His specialty is prehistoric archaeology, but he is helping the tower committee to arrange for licensed archaeologists who specialize in the appropriate time period to conduct the dig. The committee will be considering a few options during the next few weeks. Pilon met with the tower committee last week to talk about the various ways to conduct a dig at the site. “Hiring a consulting firm to do the work could be expensive if they carry out the entire project. On the other hand, if volunteer labour was used and only a project leader hired, costs would come down dramatically,” Pilon told the committee. “Opening up the excavation to the public in a limited sense could help generate more attention to the work and increase the public profile of the whole restoration project,” Pilon suggested. “For a structure built so long ago (the tower was built about 1830), you can only imagine that the ground both in and around the tower has quite a story to tell, beyond what is currently known,” Pilon wrote in a letter to the tower committee. Restoration work on the tower is slated to begin this summer. Architect J. Denis Séguin, who is designing the restored tower structure, has already suggested to the committee that several stones from the ruins have likely fallen into or around the tower and should be retrieved for re-use, if possible. Pilon estimates that the dig could take place over several weekends, during May and part of June. Members of area archaeological associations often make weekend outings of participating in digs taking place at historic locations, Pilon said, adding that he would help the committee contact these groups. The estimated cost of a limited dig at the site is between $7,000 and $10,000; the tower committee is seeking funding from other sources (such as Community Futures) so as not to use funds currently being raised for the restoration project itself. A direct solicitation campaign for the restoration project is already underway; individuals, companies and organizations are being contacted by volunteers to invite them to be a part of the restoration project by contributing either funds for in-kind services or materials. The cost of restoring the tower to its circa-1904 observation tower use is estimated at between $75,000 and $100,000. But already, services, construction materials and labour have been offered, all of which should reduce the amount of cash required to complete the project. “There are so many organizations and charities soliciting funds year-round, but response to this project has been overwhelming,” says Louise Sproule, secretary of the tower committee and coordinator of the direct solicitation campaign. “From the mail we are receiving and the e-mails, we are getting a great response. The tower seems to evoke history for a lot of people,” says Sproule. “Everyone we talk to wants to see the tower standing again. It feels like it’s time to do it – that’s what we’re hearing,” said Sproule. The direct solicitation campaign continues until the end of March; the goal for this fund raising phase is $50,000. With only one of nearly 20 individuals having completed canvassing, the committee has reached 10 per cent of this goal with the combined donations from the pledge form published weekly in The Review. Funds previously raised for the Higginson Tower project in 1997 and in subsequent years by the Vankleek Hill and District Historical Society will be directed to this project; a letter from the society states that $3,000 has been kept aside for the tower restoration project, which was initiated during the town’s bicentennial/centennial celebrations in 1997. Berthiaume Funeral Home is donating a large casket to be the container for all the personal time capsules; Berthiaume is also donating the cylinders. Costello Vaults of Smiths Falls is providing a vault to enclose the casket. In 25 years’ time, the vault will be opened so that everyone can view the contents of the time capsules. The Review is providing the acid-free paper and other materials which make up each time capsule kit. Each time capsule kit will contain bilingual instructions and suggestions on items to include (and exclude) from the time capsule. The committee is holding a dance and silent auction on May 6 at the Vankleek Hill Community Centre. André Martel and Phil Arber are hard at work soliciting one-of-a-kind items for auction, including memorabilia, antiques and hand-made items destined to be heirlooms of the future. If you have a unique item to donate, contact Martel at 678-2217 or Arber at 678-5086. In addition, all proceeds from this year’s Hilltop Bluegrass Festival, taking place on July 14, 15 and 16, will be donated to the tower restoration project. 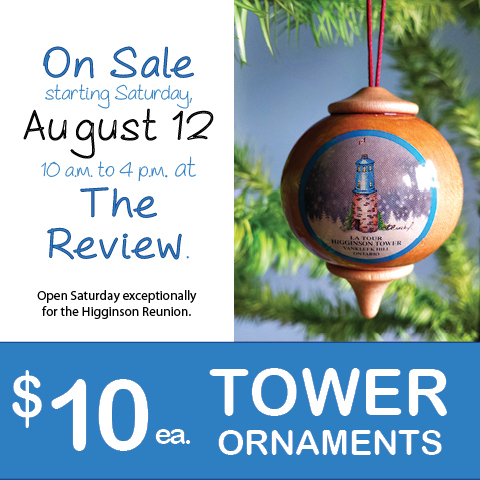 More information is available on the bilingual Higginson Tower website. Visit www.vankleekhill.ca and follow the links.